Once again it’s intermittent downpours here this morning. It’s been extremely tropical here lately. In fact, one of the wettest springs I can remember in some time. So the ride that was planned this morning has been scuttled. The picture here was actually taken a few weeks ago along the route from Dripping Springs to Johnson City. That’s me – in blue of course. We might have been able to bike through the water here because it wasn’t really that deep, but the water was moving pretty good and it’s surprising sometimes how slippery the pavement is on some low water crossings. I’ve seen people take spills with half as much water. 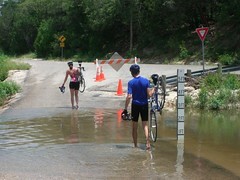 I’m sure if we attempted that ride this weekend we’d find the same thing over on River Road. With as hot as it’s been, some rain would probably feel good on the bike. Still though, I hate riding in the rain. I carry rain gear only because if I didn’t, it’d be bound to rain.